Five years later all that stuff is still in storage and you haven’t needed any of it. You’ve spent thousands of dollars for it to sit there and now you’re not sure how to start going through it. Instead of waiting 5 years, start downsizing before you move. 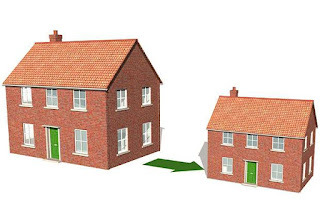 Below are 4 suggestions on how to downsize before you move. Consider what furniture will fit into your new space. Will the dining table, six chairs and china cabinet fit into your new dining area? If not, what can you keep and what needs to go? Will the table and chairs fit? Or do you need a smaller table? If you decide not to take certain pieces of furniture, don’t store them unless they are family heirlooms or investment pieces. Think of the money you can get from selling your furniture instead of spending more on storage. Look around and decide what you actually need. Do you need that treadmill? Find out more about your new neighborhood by walking around it instead of using the treadmill. This can be a difficult step but consider what your daily life is really like. Look at the items you use every day and separate them from the items you want to use everyday. Look at that treadmill. Do you walk/run on it everyday? Or do you wish you used it everyday? If it’s the latter, sell it or give it to someone else. Go through every room, cabinet, closet, box, everything you own. Decide what you want to do with each item. This is the hardest step in downsizing mainly because we have emotional attachments to most of our stuff. There are various strategies to help you make a decision. One is to hold the object in your hand or look at it intently. Do you remember when you went shopping to find that perfect picture for the living room? Does it invoke happy, positive feelings for you? If so, then keep it. Or do you try to remember where and when you acquire that item? If so, sell it or give it to someone else. Another strategy is to go through everything and separate duplicate items. Do you need 3 whisks? Once you removed the extra items, look at what’s left and decide if you really need those items. When was the last time you used that juicer? Once in the last 3 years? Then sell it. Another strategy is to ask yourself what would you replace if you lost everything in a natural disaster? Look at the things you couldn’t replace and put them aside. If you have items you’re storing and not really using, and you plan on giving them to your kids or other friends and family, then do it now. Let them enjoy the items now. Also consider what items can be replace in a smaller version. For example, can you live with a smaller dining set or a smaller couch or a smaller TV? If so, sell the large stuff and buy smaller versions. Starting the whole downsizing project early is important so you have time to sell your stuff. Letting go of your stuff is difficult but selling helps to lessen the pain. At least you’re getting something in exchange. Next, consider how you want to sell. Yard sales are good for large items. Craigslist is good for books, electronics and other stuff. If you have collectibles you want to sell, try eBay. Clothing can be sold at consignment stores. After you move into your smaller home, consider storage by going up and not out. Put shelves on the walls and get things off the floor. Also use some of your items as storage containers. Use a coffee cup to store pens and pencils in. Use a large vase or milk carton to store pictures you need to go through. Store games or blankets inside hollow ottomans. Go electronic! Instead of books, get a reader. Scan pictures and important papers and keep them in a cloud account. This will also keep them safe in case of fire or a natural disaster. Consider downsizing your DVD/Blu-Ray, CD player, game boxes, radio, and TV into a computer or laptop that has the capability to meet all your electronic needs. This will also help to cut down your utility bill. A word of caution though. Don’t get caught up buying various boxes, baskets, containers, etc. for storage. Carefully consider how much room you have and what you really need to corral loose stuff. You don’t want to overfill your space with storage containers. As a last resort, if you can’t live without some of your stuff and you don’t have room for it, rent a small storage unit. However, promise yourself you will revisit your needs in 6 months. Do you really need the stuff you’re storing in a paid unit? Finally, it you can’t sell, then give it to charity. Someone will need whatever you’re giving away. Downsizing is a difficult process but once it’s over, you can relax. You’re accomplished something important. Also keep in mind why you’re downsizing. If it’s to be closer to family, remember that. If it’s to save money, keep that in mind. If it’s to shorten your commute, which will save you time and money, keep that in mind. When it gets hard, remember your why and keep going.